We know that you, our commercial customers and stakeholders, need access to driving licence information in different formats. 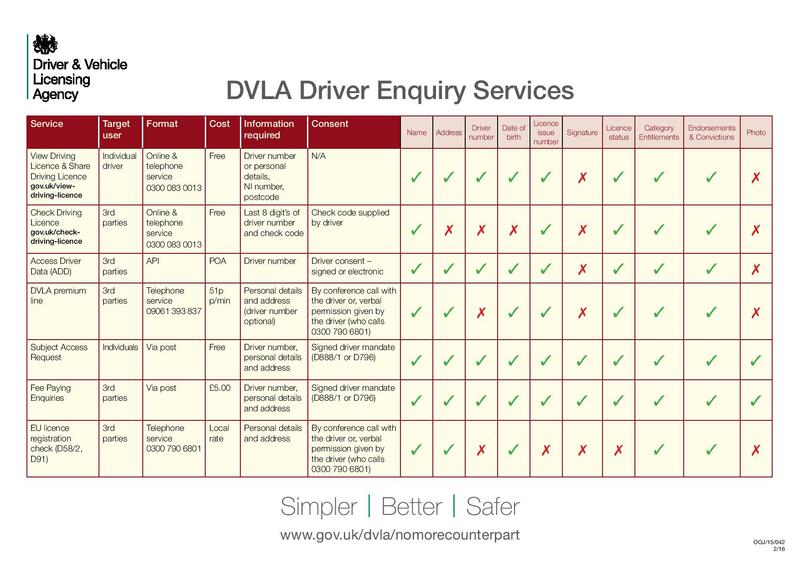 We’ve updated our DVLA Driver Enquiry Services overview chart which shows the range of services provided and what information is given. Our online Share Driving Licence service puts your customers in control so they can choose who they share their driving licence information with. We’ve provided step by step guides showing how they can share a licence and how you can redeem a licence code to view a person’s driving licence. For more information read our DVLA guide to use Share Driving Licence. We need your customers consent before releasing their driving licence information. To protect their data it’s really important that they give our telephone advisors the correct details so that we’ll only share their details with the right person/company.